The apartment offers one air-conditioned bedroom with twin or double occupancy and a double sofa-bed is provided in the lounge, along with the availability of 2 pull out guest beds which can be used in either room to maximize flexibility (max. 4 persons). Bed linen and towels are provided (not beach towels). The spacious lounge/dining room offers a TV, multi-region DVD player and leads on to the patio with sea views and stunning sunsets. A telephone is provided for free island calls so you can hire your car, book a taxi, book a table at your favourite restaurant or just catch up with your island friends! The kitchen offers full self-catering facilities including microwave, toaster, kettle, fridge-freezer and 4 ring gas hob and oven. We have also provided a mini ironing board and iron for your use. The bathroom consists of basin, w.c. shower and hairdryer. There is a roof terrace with outstanding panoramic views. This apartment is our own private apartment which is managed locally and weekly maid service is included. If you have any questions then please feel free to contact us. 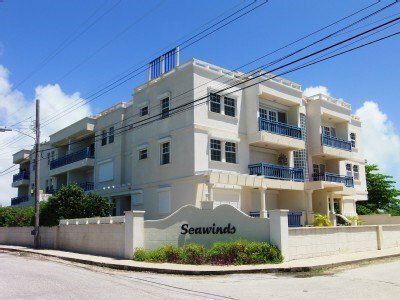 Situated right next to the famous Silver Sands beach which has excellent conditions for windsurfing, wave-riding and kitesurfing or just sun bathing and being the location of de Action Shop run by world-ranked Barbadian windsurfer Brian Talma. There are a few restaurants and a mini-mart nearby with a greater range of supermarkets, shops, restaurants and banking facilities only 5 minutes drive at Oistins which is popular for its Friday fish fry!